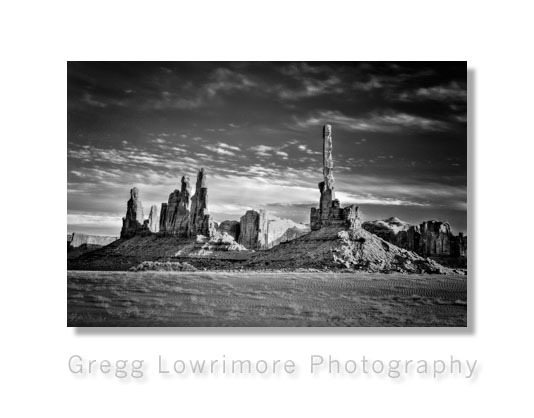 This image comes from Monument Valley at a locale known as “Ford’s Point” named after the Actor/Director John Ford, who filmed several of his films in the valley. John said, “The real star of my Westerns is the land. A Western is all about the land.” – See more here. 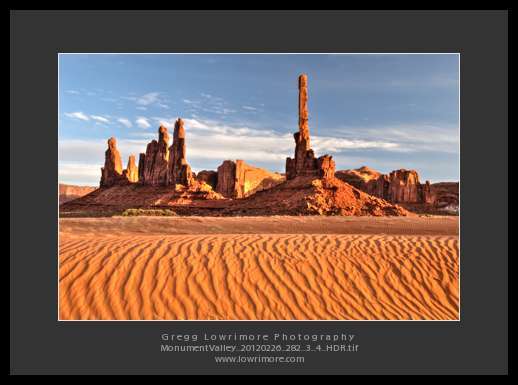 Posted in Fine Art, HDR, Landscapes and tagged Ford's Point, monoliths, Monument Valley, sage, sandstone, utah by greggl with no comments yet. I was looking back over my photo library tonight and came across some unfinished imagery from a trip to Arizona’s Monument Valley last February with Steve Parker. All three images are 3-shot HDR images processed through either Photomatix Pro or HDR Efex Pro and/or Silver Efex Pro 2. And all three are from a guided tour into the Totem Pole site within Monument Valley. 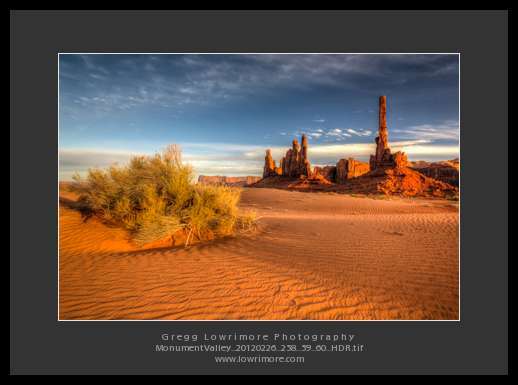 Posted in General, HDR, Landscapes and tagged desert, landscape, Monument Valley, totem pole by greggl with no comments yet. Another image of North Window, looking directly at Elephant Butte. Same day, same general spot as yesterday’s post and image, but this time more of the evergreen tree in the frame. Plus I present both the original color version along side a black and white version below. Below is an alternatively processed version of the same image above. 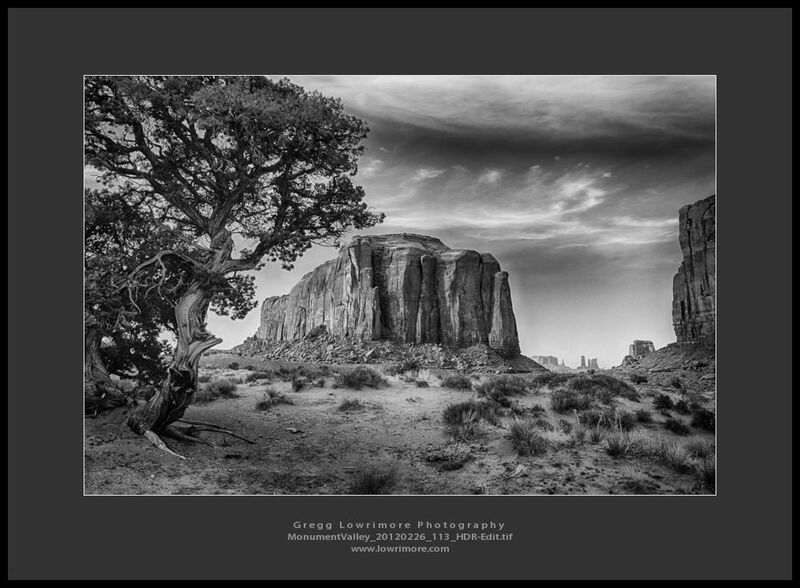 I love the black and white version for its contrastiness and pop, whereas the color version above seems bland and lacking that special pop I normally like to see in my landscapes. What are your thoughts or preferences? Do you like the black and white version or do you still like the original color version? Why? 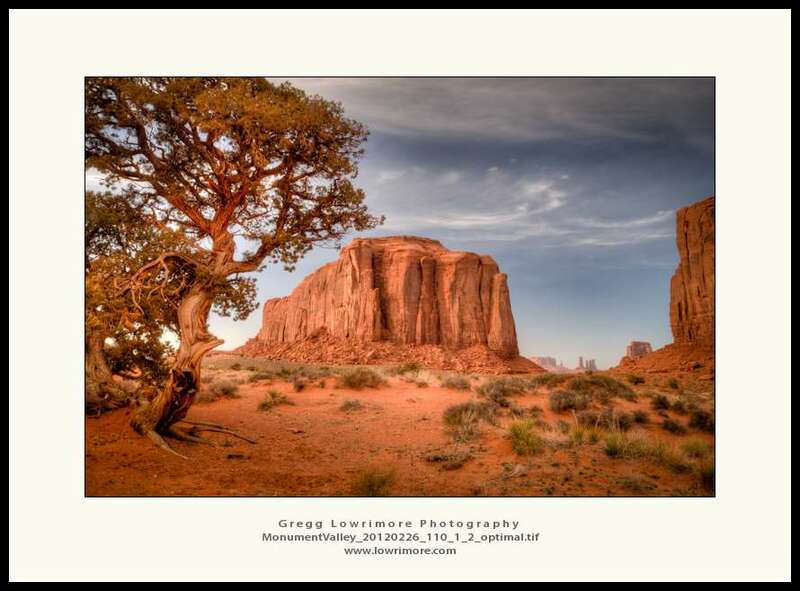 Posted in HDR, Landscapes, Shoots and tagged Arizona, desert, Monument Valley, national park, North Window, southwest, sunset by greggl with no comments yet.